With 1.18 billion daily active users as of September 2016, Facebook is an excellent place to establish a formidable presence for your brand. But with so many users sharing so much content, you will need whatever competitive advantage you can get to stand out from the crowd. Join us on a magic carpet ride into the wonderful and (surprisingly) exciting world of Facebook hacks for business. You wouldn’t judge a book by it’s cover, but you might judge a business. Your brand’s Facebook cover photo and profile picture are the first things a prospective customer sees. If the photos are blurry, boring, or inappropriate, there’s little to entice a Facebook user to click on your page. Read on for a few exceptional Facebook hacks to spice up your presence on the platform. Much like getting dressed in the morning, creating a great Facebook profile requires a sense of style. A well-coordinated Facebook profile picture and cover photo can grab your audience’s attention and demonstrate your professionalism. Tricked Out Timeline is a neat tool you can use to design matching cover and profile photos. Choose a high-quality photo for the best results. What once was a single photo of a man skiing down a mountain, is now a visually appealing and compatible profile picture and cover photo. This Facebook hack tool allows you to download both photos in the correct sizes for the platform. Let’s say your business has a fun office team building event. You want to share the photos from the special day with your audience so they can see the wonders of your lively and relatable team. But when you upload the photos and videos to Facebook from your phone, the quality is horrendous. That can be fixed. By adjusting a few settings in your Facebook account, you can enable the HD upload and easily share high-quality images and video on your profile. Image via Modcloth on Facebook. Uploading high-quality photos and videos is a Facebook hack that can help your brand put your very best foot forward. No more grainy videos of trust falls for you. Call-to-action buttons link to any destination on or off Facebook that aligns with a business’s goals. Perhaps Facebook users will be inspired by your compelling photos and videos to book a room at your bed and breakfast. Or maybe they have questions and need a straightforward way to contact your business. If you hope to raise money for your non-profit organization, you may also have the option of adding a “Donate” button. Click on the toggle below Set up a Link to an App? Once you’ve created a call-to-action button, you can track the number of people who have clicked on the button to make sure that the feature is driving traffic the way you planned. 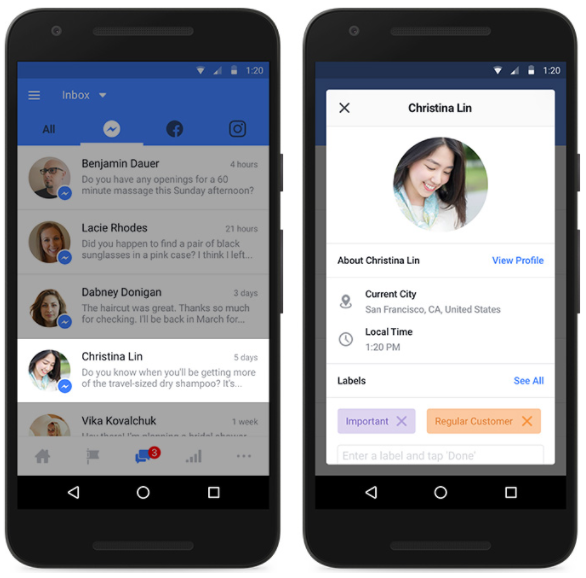 Facebook now offers one unified inbox to help you simplify your customer service experience over social media. If you actively manage communications for your business across Facebook, Messenger, and Instagram, you can save time with the updated inbox by responding to all inquiries within a single app. You’ll be able to quickly scan all three channels for new updates and avoid the potential fallout from waiting too long to respond. If your business receives a high volume of daily messages, or if you have entire teams dedicated to online customer service, the Facebook Messenger Platform or Facebook Marketing Partners features might be a good option for you to manage customer interactions. With Messenger Platform, you can build customized automated experiences to communicate with large numbers of customers. With Facebook Marketing Partners, you can handle the flow of incoming communications by chatting live with your customers. As opposed to the complete anonymity of a phone call, when someone interacts with your business through Facebook Messenger, you can view their profile to learn a bit more about who they are and shape your response accordingly. You can determine whether you are dealing with a regular user of your service or a potential new customer, someone local, or an interested visitor. Image via Facebook for Business. To do this, simply tap the person’s name to see their profile, as well as their previous interactions with your business. Facebook offers a variety of interesting features for businesses that encourage users to engage. Depending on what service your brand offers, you may be able to make use of the following Facebook hacks. If you own a restaurant, customers can now order food from you directly from your Facebook Page. If you use Delivery.com or Slice to facilitate service, you can create a Start Order button users can act on after being enticed by your delicious-looking photos. For local businesses that require appointments booked in advance—such as spas and salons—customers can now request a time via the business’ Facebook Page and view their entire slate of services and offerings. You can get back to them on Messenger to confirm the appointment. Some local business Pages, such as insurance companies, will now have a Get Quote button at the top of their Page that lets users easily and quickly request a quote from the business. Sometimes a two-dimensional photo just doesn’t cut the mustard. A 360-degree photo or video can really give your marketing strategy an extra special something. Perhaps you’re a realtor trying to sell a home. You can give your potential buyers a 360 video tour of the kitchen to generate leads. Maybe you sell snowboards. What could be cooler than a 360 photo from a mountain top? Last year Facebook updated their tools so you can now easily share 360 photos. Simply take a panorama with your phone or capture a 360-degree photo using a 360 photo app or 360 camera, and then post it on Facebook as you would a normal photo. Facebook then converts it to an engaging 360 photo that people can explore, similar to how people experience 360 videos on Facebook. What the heck is spatial audio you say? Spatial audio is basically 3D sound for 360 videos. It’s an immersive audio experience meant to replicate how humans hear sound in real life, but delivered over headphones. Pretty neat, right? As audiences move around in a 360 video, the sound moves around with them, creating the effect of feeling like they are really there. If audio is of the essence for your product, you can learn how to the create spatial audio. Facebook Live is Facebook’s live-streaming video functionality. Users can broadcast Live videos using their smartphones. It’s available to all Pages and profiles on Facebook for iOS, Android, and the Facebook Mentions app. Additionally, Live broadcasts can be streamed in Facebook groups and events. Check out our Facebook Live Video: The Complete Guide to Live-Streaming for Business to learn more. Here are a few Facebook Live hacks you may not have heard before. You can make your Facebook Live video look professional and multi-layered using the latest technology. If you have a savvy developer or publisher on your team, you can use this Facebook hack to take full advantage of Facebook’s API (application program interface). The Facebook Live API enables you to build video streams that mix multiple video and audio sources and introduce special effects. Publishers can get started with the Live API by contacting one of Facebook’s Media Solutions partners. According to initial Facebook data, people comment 10 times more on Facebook Live videos than on regular videos. Your business can use that feedback to tailor your content specifically to your audience. With this Facebook hack, viewers can see their reactions animate right on top of the video. They can select icons representing Love, Haha, Wow, Sad or Angry, and the Live Reactions appear in real time and disappear quickly so broadcasters and other viewers can get a sense of how people are feeling at different points during the live video. Facebook compares the feature to hearing a crowd applaud and cheer. If you can’t imagine how your business might utilize this tool, check out our 7 Tips for Marketing a Boring Business to get the juices flowing. Facebook Messenger may seem like a tool that is only for personal use, but businesses are finding that it’s a great way to build relationships with their customers as well. Facebook Pages alone receive nearly 5 billion comments, messages, and visitor posts combined every month. One of the the most recent and helpful Facebook hacks the platform has added is payments through Messenger. Your business can now sell products and services directly to customers in the chat app. Customers can pick out what they want and check out within the Facebook Messenger app. Your team’s clever developers can get more details on the Messenger Blog. Wherever your customers are—at home, out with friends, at work, at the gym, on a roller coaster—you can make them an offer they can’t refuse with these Facebook advertising hacks for business. Offering a discount or promotion is a wonderful way to get your audience’s attention and encourage them to take action. Your brand can use Facebook offer claim ads, to create and share awesome discounts and promotions for your business. People who claim in-store offers receive a barcode or QR code that can be pulled up on their mobile device at checkout. People who claim an online offer receive a discount code and are sent to your website to shop. They can use the offer code at checkout to redeem the value. Facebook provides several measurement tools for tracking the effectiveness of your offers and promotions. You can track how many people visit a store location after seeing a Facebook campaign, to confirm that the marketing effort you’re putting in is working as it should. Your team can optimize ad creative, delivery and targeting based on store visits and see results across individual stores or regions to get the most out of your Facebook campaigns. Make managing Facebook easy using Hootsuite. Schedule posts, share video, engage with followers, and measure the impact of your efforts. Try it free today.